Muscatine is conveniently located on US Highway 61, Iowa Highways 22, 38, & 92, and is just 25 minutes from the metropolitan area of the Quad Cities. Muscatine is a 2.5 hour drive from Des Moines and a 3 hour drive from Chicago. It is within a half-day’s drive of St. Louis or Minneapolis. Four airlines service the Eastern Iowa Airport, averaging more than 70 flights a day to and from nine different non-stop destinations. The airport is located just outside Cedar Rapids, north of I-80 and right off I-380. Trailways Bus Service from Muscatine to the Quad Cities and Burlington is available several times a day. MUSCABUS is the City of Muscatine’s Bus public transit system. It has regularly scheduled routes as well as a shuttle service. This bus system is an inexpensive way to travel throughout Muscatine. 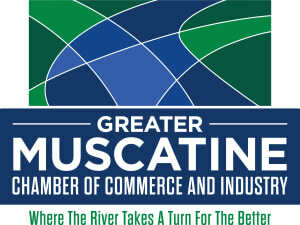 For route and pricing information call 563-263-8152 or visit the City of Muscatine’s website. Muscatine offers a variety of parking options to meet your needs. Historic Downtown Muscatine features limited, free parking on Second Street and metered locations in much of the other downtown areas. Parking meters and timed parking limits are enforced Monday through Friday from 8 a.m. to 5 p.m., except for civic holidays. Detailed information about Muscatine’s parking options can be found through the City of Muscatine’s Parking Division.